The Base Condominium. This 51 sq.m. 2 bedroom unit is positioned on the 8th floor of this city centre condominium project. 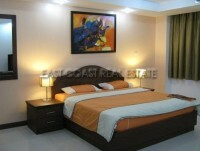 It comes with beautiful furnished and ready to move in. There is European style kitchen with big refrigerator, open lounge and dining areas with 4 seats dining table, sofa and flat screen TV. Balcony offers city and sea views. King sized bedroom with built-in closet & TV. Second bedroom provides single bed and a good views of swimming pool. Modern fitted bathroom with hot water shower. Air-conditioning throughout. The Base is developed in the heart of Pattaya City, along Pattaya 2nd road (just opposite Central Festival shopping mall). Being developed by well-renowned Bangkok developers, Sansiri. Walking distance to everything. Available for RENT with a minimum of a 6 month contract at 35,000 THB per month excluding all utility bills and 2 month deposit is required. Living area : 51 sqm.